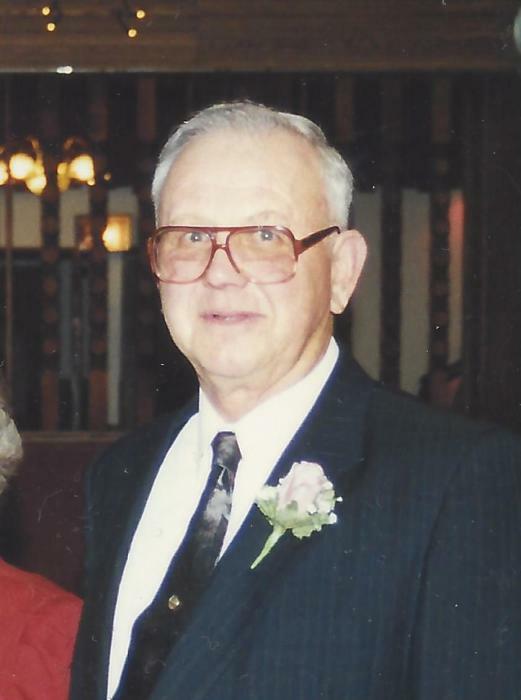 JAMES LEENDERTS, age 80, of Hills, formerly of Ellsworth, died Saturday, February 9, 2019, at the Sanford Luverne Medical Center. He was born August 17, 1938, in Rock Rapids, IA, to Abel and Rakie (Mulder) Leenderts. He served his country in the United States Army. Jim married Peggy Gertsema in August of 1980, at St. Mary Catholic Church in Ellsworth. After their marriage, the couple lived in Ellsworth. Jim owned & operated Leenderts Seed in Ellsworth. He also operated his own trucking business, hauling livestock, before retiring in 2005 because of health reasons. He was a member of Zion Presbyterian Church in Ellsworth. He enjoyed playing cards and watching NASCAR. Jim is survived by his son, Doug (Sara) Gertsema, Overland Park, KS; Peggy’s children, Joe (Mary) Gertsema, Sioux Falls, SD; Jim (Sandi) Gertsema, Slayton; Margaret (Keith) Essman, Adrian; Mike (Vicki) Gertsema, St. Joseph, MO; Dan (Barb) Gertsema, Overland Park, KS; Rick (Carrie) Gertsema, Duluth; Caroline (Joe) Davis, Midland, MI; and Tracey (Ray) Lorang, Hartford, SD; twenty six grandchildren; thirty three great-grandchildren; one great-great-granddaughter; five siblings, Reva Hoff, Hills; Richard Leenderts, Hills; Leonard (Delores) Leenderts, Hills; Harold (Torberg) Leenderts, Olso, Norway; and Henrietta Hughes, Iowa. He was preceded in death by his parents; wife, Peggy; grandson, Brad Gertsema; great-grandson, Isaac Gertsema; three sisters-in-law, Hendrene, Lois and Kari Leenderts; and two brothers-in-law, Cornie Hoff and Al Hughes. A memorial service will be 3 pm Saturday February 23 at Zion Presbyterian Church, in Ellsworth, officiated by Pastor Paul Snyder. A time of fellowship will be one hour prior to the service at the church. A private family burial will be at a later date. Dingmann Funeral Home, in Luverne, is in charge of arrangements. behalf of the Leenderts family. To view an online obituary, view a video tribute or order flowers, please visit www.dingmannandsons.